After our experiences at Luc’s, Mecca, and Arirang, we’ve come to believe that some of the best international cuisine in town is put out by pint-sized kitchens shoehorned into the corners of out-of-the-way ethnic groceries. As such, when we were told about another grocer/kitchen combo out on Bethel Rd. (thanks, Amar), we were primed to expect the best… and we are happy to say that we weren’t let down. Apna is located in a fun (from an alt.eats perspective) little strip mall across the street from Microcenter that is also home to Banana Leaf, a Korean restaurant, a Thai/ Vietnamese restaurant, a Mexican grocery store, and a bubble tea shop. While Apna’s primary focus seems to be on take-out and catering, they’re also happy to serve you at a table in the back of the store that seats up to 8 people. 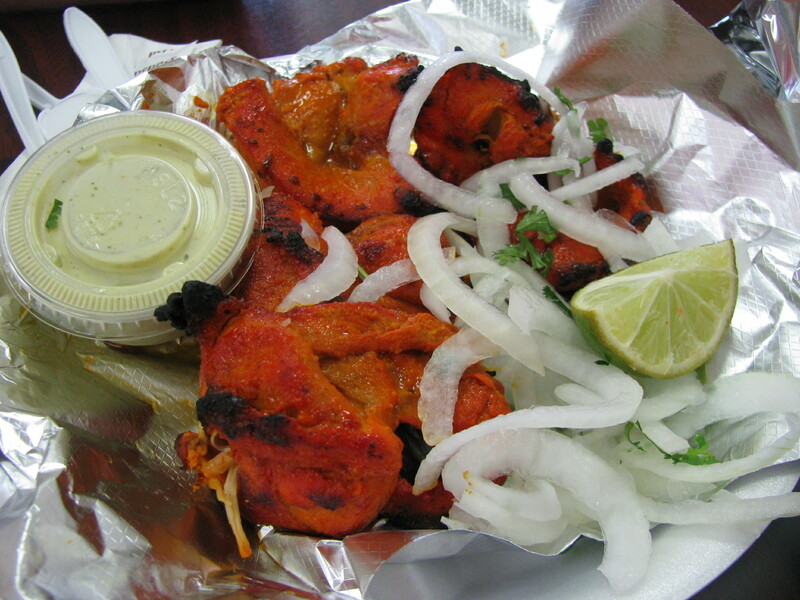 Apna Bazaar’s kitchen specializes in tandoori and karhai preparations. 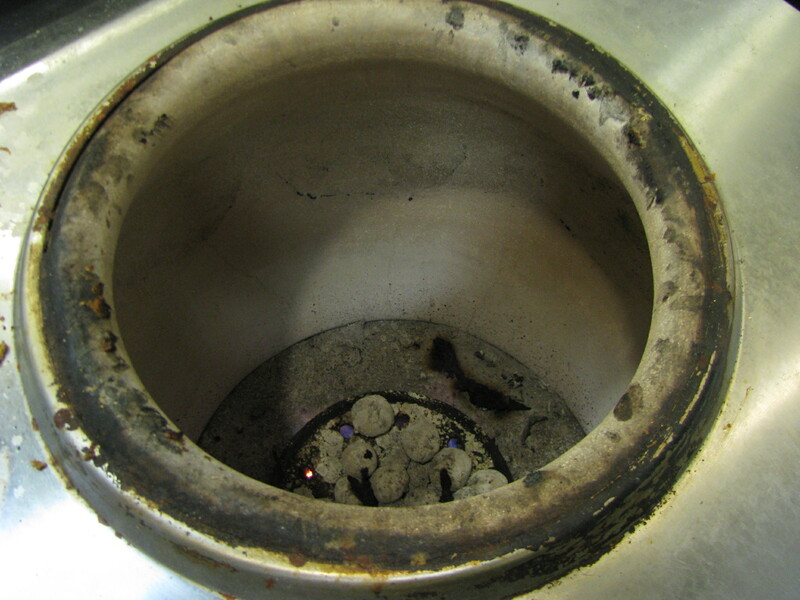 The photo above is the tandoor oven, which we were allowed into the kitchen to admire. 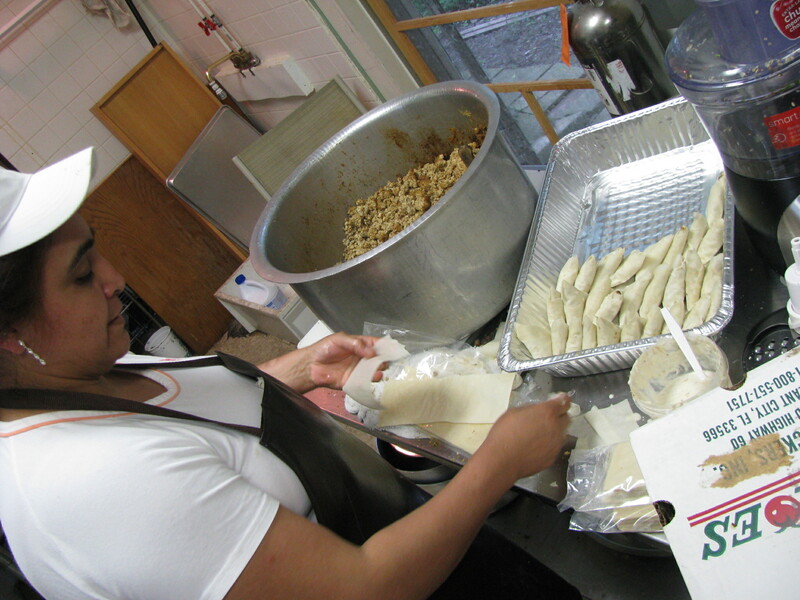 Another shot in the kitchen (below): making chicken samosas. We started with tandoori boneless chicken (you can also get a leg and thigh or a whole chicken), served straight from the tandoor. Garnished with onion, lime, and with a relatively mild sauce on the side, this dish was a little spicy, far more tender than most tandooris we’ve had, and very very popular. It was altogether too quickly devoured. Luckily for our hungry group of 8, the food kept coming. 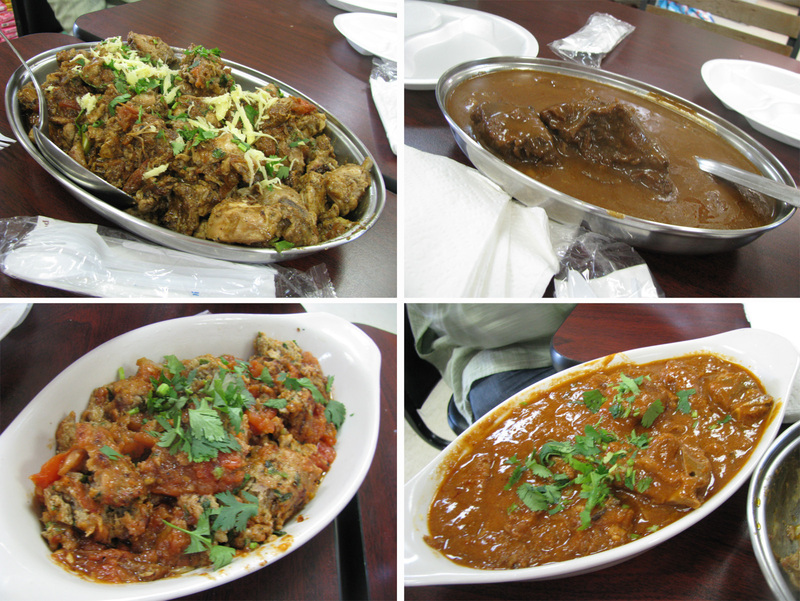 We sampled (below, clockwise from top left) chicken karhai, beef nihari, goat qorma and chicken kabab karhai. The word karhai (or karahi) refers to both a traditional wok-like Indian/Pakistani cooking dish, and a cooking method that uses this dish. 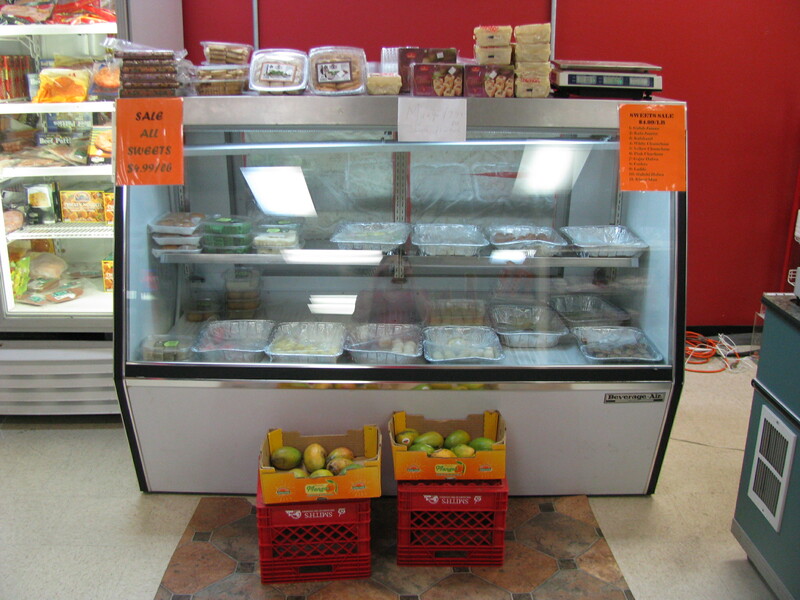 Apna offers chicken (whole or half), goat, and kabab karhai preparations. We tried the (bone on) chicken karhai – fragrant with ginger, this was one of the more mildly spiced dishes we tried – and the kabab karhai, a generous quantity of heavily spiced ground chicken shish kababs, chopped up and sauteed with onions and tomatoes. Both were enjoyed by all, with the nod going to the kabab version. The nihari was another crowd pleaser, a delicious rich stew of tender beef shanks cooked overnight. Apparently a popular breakfast dish in Pakistan, Apna’s nihari was deeply flavored with cloves, cumin, ginger and cardamon, and had a heat that came on slowly and peaked impressively. The qorma (korma) consisted of tender goat served in a sauce whose richness was similar to the nihari, but was distinctly different in flavor with plenty of cardamon and a lot of chili. Among a table full of spicy-hot foods, it was the hottest of the dishes that we tried. 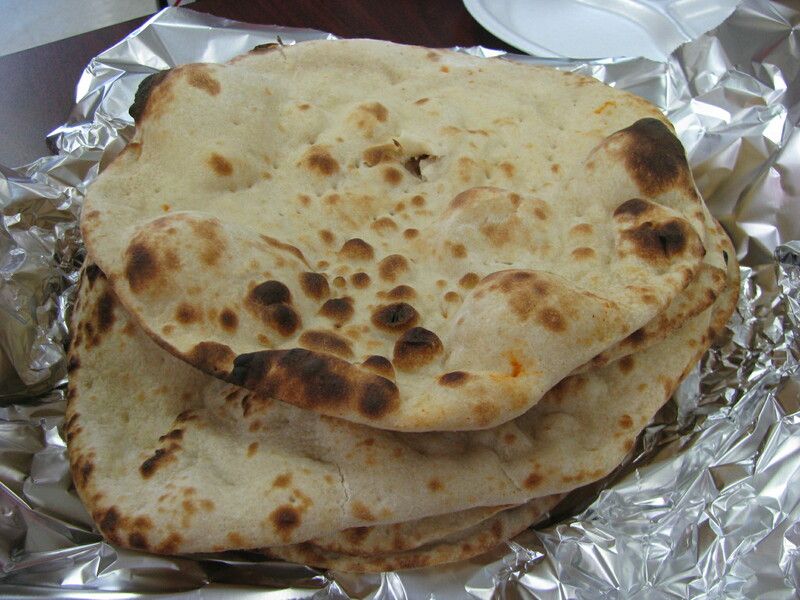 The meal was accompanied by seemingly endless piles of naan bread. Apna’s naan is different than most, and is considered by our Indian friends to be more authentic – made with whole meal flour, it was lighter, crisper, less doughy and served without any butter or ghee. Apna Bazaar also has a selection of Indian sweets including gulab jaman, laddo and halwa, but as we were too full, we managed only a cup of steaming hot milky chai. 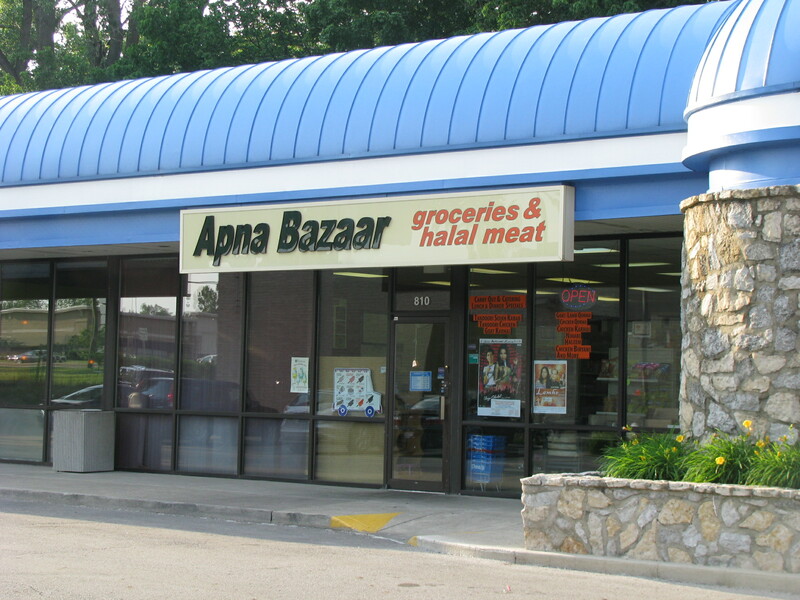 Apna Bazaar does not provide many options for vegetarians, and with the exception of potato samosas and naan bread all of the dishes are meat based. 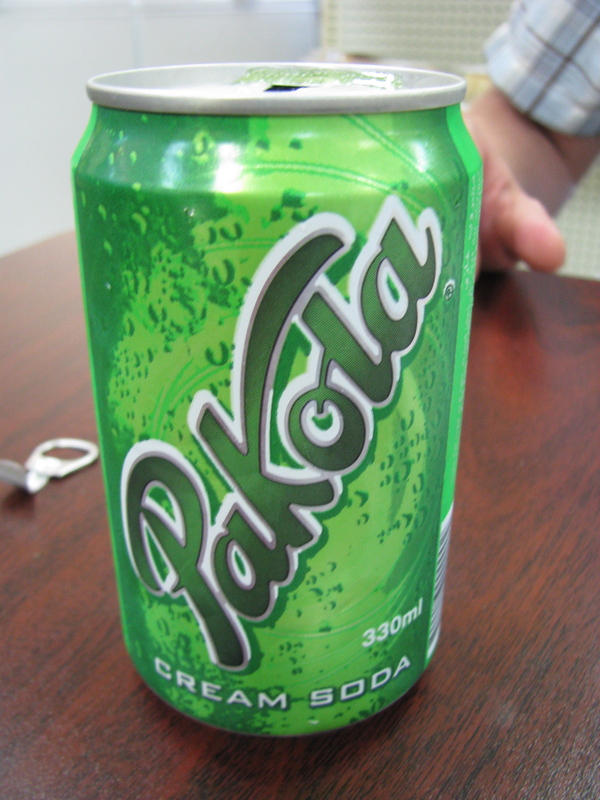 Drink selections are also limited but include water, chai, Coke and some Pakistani sodas including the sweet and floral Pakola. Our bill, including drinks, came to about $10 per person. The owner seemed willing and able to adjust the spice level in most of the dishes. We recommend calling ahead an hour before you want to collect your food.